High quality slipmats not only feature colorful artistic designs, but are also designed to be the finest slipmats available on the market today. Made out of a smooth but strong material, our slipmats provide durability and won‚Äôt scuff or damage vinyl, and due to their unique matte surface, they are far more resistant to dust and other particles. 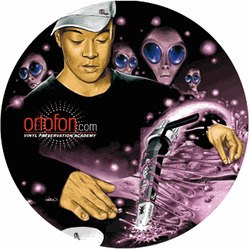 Furthermore, they are extra thin and provide optimum feel for turntablists and mix DJs alike. Each design is a limited edition and will not be reprinted once sold out.